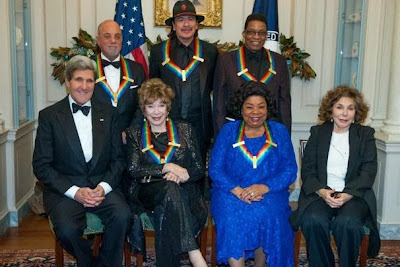 Carlos Santana was among the recipients of the 2013 Kennedy Center Honors over the weekend in Washington, alongside Billy Joel, Shirley MacLaine, Herbie Hancock and opera singer Martina Arroyo. The annual honor is given to those in the performing arts for their lifetime of contributions to American culture. Billboard reports the tribute began with a medley of Santana tunes: "Corazon Espinado," "Black Magic Woman" and "Oye Como Va."
Among those saluting Santana were Sheila E., Steve Winwood, Tom Morello of Rage Against the Machine, Buddy Guy, and Alice Cooper’s touring guitarist, Orianthi Panagaris. An immigrant from Mexico who began learning English from American television, Santana is one of only a few Latinos who have received the honor so far. He first picked up the guitar after hearing blues and rock `n' roll on the radio, and he wanted to be like his mariachi musician father. His family moved to San Francisco and, by the age of 22, he was playing at Woodstock. "Now Carlos is a citizen of the world. He belongs to all of us," said Harry Belafonte. "Carlos, you haven't transcended race and origin. Really, who of us has? You continue to be informed by the immigrant experience on the journey to the great American dream." Before the show, Santana said he'd never been to the Kennedy Center before but the award stands apart for him because it came during the Obama administration. "It's really supreme because the award is being given to me by a black man. If it wasn't like that, I would say just send it to me," Santana said. "But since it's Mr. Barack Obama, I definitely had to make myself present and say from the center of my heart, `you are the embodiment of our dreams and aspirations.'" The Honors Gala will be broadcast on the CBS Network for the 36th consecutive year as a two-hour primetime special on Sunday, December 29 at 9:00 p.m. (ET/PT). Santana resumes his Las Vegas residency next month at The House Of Blues.